The suite of web-based office solutions that offers more productivity and collaboration within your office. 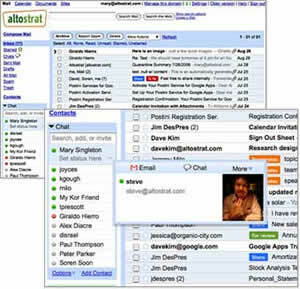 It consists of email, calendar, documents, sites, eSMS and eFax services. Single login to a suite of business solutions to collaborate, communicate and store in the cloud. 24/7 access anytime, anywhere across devices. Secure sharing and editing of documents. Shared cloud storage between ONEOffice Email and Drive. Blocks spam and viruses before they get to the inbox. Resilient, robust, high-availability design. Similar backbone to the Google Apps enterprise versions which provide 99.5% SLA uptime in any calendar month. HTTPS access for secure transfer of information over the Internet. Don't miss an email with email conversation view. Powered by industry-leading Google search technology. Fully integrated with ONEOffice Hangout that comprises video, voice and group chats. Retrieve, update and share external contacts with other users easily with Shared Contacts. The email alias feature allows the domain administrator to create and delete an alternative email address via ONEOffice Dashboard that points to an existing user account. *Compatible with iPhone and Android devices and Blackberry phones. Certain features are not available on some models. Visit the Google Apps mobile access page to learn more. Depending on your mobile plan, additional data charges may apply when you check emails on mobile. Set up a calendar and share it with others. Receive event reminders and notifications on mobile phone via SMS. Create and send event invitations and keep track of everyone’s responses and comments, all in one place. Add events to calendar without leaving your ONEOffice Email inbox. Search the calendar for events to find their dates. Or, search public calendars to discover interesting events and add them to the calendar. 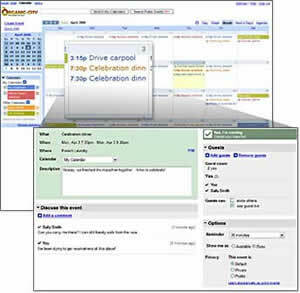 Users can also download and install a synchronisation client on their PC for synchronising the calendar with their Outlook client. This is free synchronisation software by Google. ONEOffice Calendar is able to delegate the calendar to other users without the need of a rich client. Sync files from your hard drive to Google Drive on the web, giving you access to your files on any device, at any time. Word processing, spreadsheets, forms and presentations are all accessible via a web browser interface. Offline access is also available. Users can share the same online copy of each document, spreadsheet or presentation. All revisions are saved and recoverable. Team members are able to edit a shared document real-time over the Internet. Present and publish through the web as presentations can be delivered to remote audiences. Work across traditional file formats. Import and collaboratively edit or publish .doc, .xls, .csv, .ppt, .txt, .html, .pdf and other formats. You can export as well. Files within ONEOffice Docs when sent as an attachment will not be attached to the email. Alternatively, a link to the file will be provided, and users can access the files instantly without the need for upload/download. This saves email space and bandwidth. Collaboration is also easier as only one copy of the content needs to be changed. 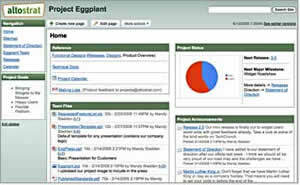 Create sales forms, surveys and get auto-populated results in a spreadsheet in real time. Make useful information accessible – Create an intranet or let project teams or departments build sites to capture and share events and knowledge. Choose from a growing list of page types/templates: webpage, announcements, file cabinet, dashboard and list. Share files simply – File versioning is done automatically, so it's easy for users to make updates and get the latest version. Supported formats include .doc, .xls, .csv, .ppt, .txt, .pdf and more. Unify content from many sources – Display ONEOffice Documents, Spreadsheets, Presentations, YouTube videos, Picasa slideshows and gadgets without any programming skills. Built-in Google search technology, so employees can find useful information as easily as searching the Internet. No coding or system expertise is required to update pages or create new internal sites, so anyone can add to shared knowledge. Access documents via your web browser. Edit your working files in real time together with colleagues. Create sites without any programming skills. Reduce software and hardware overheads and lower storage costs. Easy administration without requiring the expertise of IT personnel. Choose to conduct presentations virtually without travelling. Built-in filtering that stops spam and viruses. Completed a SAS 70 Type II Audit. Control over who has access rights to your documents. Select a plan to make a purchase. *Higher storage is available. Please contact us to find out more. Singtel ONEOffice is a next –generation service which features a suite of collaboration tools which runs on the web browser without having to install a client. What do I need to do to setup ONEOffice? You do not need to worry about the setup as this service is included when you purchase the solution. The one-time setup includes assisting customers to update the CNAME & MX records with your domain provider, creating up to 5 users and assigning licenses, updating the POP/IMAP password and configuring ONEOffice on email clients. You can use the solution immediately when the setup is completed. ONEOffice is a web-based hosted solution, which means you can access ONEOffice at anytime, anywhere you have an Internet connection. This technology is referred as "Software-as- a service" in which IT applications are provided "as a service", allowing users to access these applications from the Internet without needing to maintain the infrastructure that supports them. Since ONEOffice is web-based, your employees can be productive from anywhere, whether they're at their own desk, using a different computer, or on the go with a mobile device. How is ONEOffice different from a free @gmail.com account? When you sign up for ONEOffice for your business, you sign up with your own company domain name. So instead of having a user@gmail.com email address, you would create or maintain a company email address such as user@company.com. The admin in your company will be given rights to manage and control the user accounts across your company domain. ONEOffice Calendar: Enables conference room and resources sharing, allowing you to schedule office conference rooms or other shared resources in your office. ONEOffice eSMS: Usage based charges where you can send SMS to multiple recipients via your email account. ONEOffice eFax: Wthout having to buy a physical fax machine, you can attach a file and just send a fax the same way as sending an email. Why should I use ONEOffice instead of an on-premise mail solution? Lower cost: ONEOffice is being delivered over the web at a fraction of the cost of installed systems. This means that ONEOffice can provide a significantly lower total cost of ownership (TCO). Mailbox redundancy, infrastructure upgrades and infrastructure scaling are all handled behind the scenes, so your business doesn't need budget time and money for these projects. Higher quality: ONEOffice offers superior security, reliability, and storage space than most organizations can accomplish with an on-premises solution. Improved usability: ONEOffice provides the simple, intuitive interface so that there is minimal training resource for end-users. Leader in Innovation: ONEOffice powered by Google continues to demonstrate its industry leadership in terms of web-based innovation. Driving this platform forward, Google has the leading computing platform and have assembled one of the strongest teams of computer scientists in the industry. As an ONEOffice customer, you get to experience that innovation first-hand as product enhancements are rolled out on a regular basis. Can I set retention rules under ONEOffice? Yes you can set retention rules to control the duration of the data to be retained from user accounts. For ONEOffice users, you will need to purchase Vault add-on first in order to do so. For ONEOffice Unlimited users, you can set rules straight away. I have used 90% of my storage limit, can I increase my storage size? Yes, you can buy storage add-on to increase your storage size. Add-on storage size starts from 20GB with S$5.78 per month. You can also opt to upgrade to ONEOffice Unlimited for the entire organisation should most users require the storage increase. You can upgrade online under ‘Manage App’ after you login to myBusiness account or you can contact us for assistance. I can buy 100GB with S$2.79 per month under my personal Gmail account. Why is the storage add-on pricing under ONEOffice so expensive? The storage pricing you are seeing under your personal account belongs to you and you can't transfer to another user. You will also need to purchase directly with your credit card. Under ONEOffice, the storage add-on is for business and bill directly to your registered billing account. The company admin can assign storage add-on to individual users under the organization as well as re-assign to another user if assigned user resigns. Can I use my own domain name for the free trial? Yes, you can use your own domain for the free trial. Make sure you choose the Free Trial for customers who have an existing domain name from the offer page. Can I take the free trial if I do not own a domain name? Yes, if you do not have your own domain name, you can choose the Free Trial for customers who require a temporary domain name from Singtel from the offer page. What is included in the complimentary assistance for Free Trial? Our representative will contact you within 3 business days from the service provision date to assist you in setting up your ONEOffice Account. This includes support to update CNAME and MX Records, create up to 5 users and assign licenses. Can I use the same domain name when I convert from trial to paid? Yes, if you are using your own domain name. You can directly convert from Trial to Paid by clicking the Upgrade button on the Manage Licenses Page and proceed to Shopping Cart. No, if you are using the temporary domain name as it can only be used during the trial period. To use the paid version of ONEOffice, you will be required to provide your own domain name. If you need to purchase a domain name, please click here. I noticed I am not able to use eFAX, eSMS. eFAX and eSMS services are not available for trial. I need more user accounts for testing, can I get more licenses for the trial? No, customers can enjoy up to maximum of 5 user licenses for trial. When can I start using ONEOffice Trial after my purchase ? What do I need to do? You can start using the ONEOffice once you have configured the CNAME and MX records. If you purchased the ONEOffice trial using the temporary domain assigned by Singtel, the service will be activated within 3 business days. Can I request for extension if I need more time to trial the app? No, the trial is valid for 30 days and will not be extended. I have a paid ONEOffice version, can I get the free trial? No, the free trial is available for customers who does not have a paid ONEOffice service. Will the ONEOffice free trial be terminated after 30 days? Yes, the service will be automatically terminated upon expiry of the free trial. Please backup all your data as it cannot be retrieved after the trial period. Does ONEOffice work with Microsoft Outlook and other clients? ONEOffice can work with Outlook and other application clients, so your employees can continue using a familiar interface on the front-end, while ONEOffice's servers works on the back-end, helping you save on significant cost for your business. I have to send out a lot of emails on a daily basis. Does ONEOffice have a sending limit? Each user account can currently send email to 2000 external recipients per day to prevent abuse of the system and to help fight spam. For emails sent via POP3/IMAP client, the limit will be 100 unique addresses and 500 addresses for web-based email client. If one of your mail accounts reaches the limit, the account will be disabled for 24 hours. Does ONEOffice work with BlackBerry devices, the iPhone and other mobile phones? ONEOffice is accessible from a variety of mobile phones, including BlackBerry devices, the iPhone, Windows Mobile and many less powerful mobile phones. We offer multiple syncing capabilities so that you can access your ONEOffice apps when you are on the go. Visit the Google Apps mobile access page to learn more. What browsers do ONEOffice support? From 1st August 2011 onwards, only the current and prior major release of Chrome, Firefox, Internet Explorer and Safari will be supported on a rolling basis. Each time a new version is released, the update will be supported and the third-oldest version will not be supported. The following browsers and their previous versions will not be supported as of 1st August 2011: Firefox 3.5, Internet Explorer 7 and Safari 3. Google Cloud Connect is a plug-in for Microsoft® Office 2003, 2007, and 2010 that lets you share and simultaneously edit Microsoft Word, PowerPoint®, and Excel® documents with other people in your organization. You get the collaboration benefits of Google Docs, while continuing to use Microsoft Office. How does Cloud Connect works? Syncing and sharing documents: Google Cloud Connect tracks, manages, and syncs all changes on your Microsoft Office documents into one updated version for each document. Each document that you sync through Google Cloud Connect gets a unique URL, or web address, that you can share with collaborators through IM or email. Depending on the privacy setting you've selected for the document, other people will be able to click this link and view the document in the browser. Collaborating simultaneously on documents: Google Cloud Connect for Microsoft Office lets you easily share documents with other people. When you add someone as an editor in a document, they receive an e-mail letting them know that a document has been shared with them. From there, they can open a link to view the document in the browser, or if they want to make edits, they can download the document and open it in Microsoft Office. When another editor edits a document in Microsoft Office, all changes get synced to and will be reflected on your screen. Revision history: Using Google Cloud Connect, you can edit a document both online and offline. Every time you sync a document, the revisions of a document are stored so you can easily roll back to a previous version. You can retrieve and revert to any prior revision of a document at any time. What are the system requirements for using Google Cloud Connect? 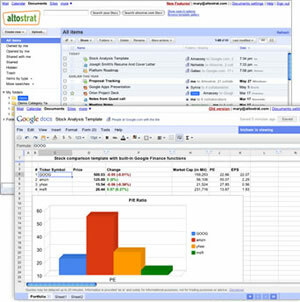 Google Cloud Connect works for Microsoft Word, PowerPoint, and Excel files for users of Microsoft Office 2003, 2007, and 2010. It supports Windows XP, Windows Vista, and Windows 7. It is currently not available for Macs. For more details, see System requirements. What is happening to Google Docs? Now you can get to your Google Docs via Google Drive. The Google Docs control panel service has been renamed to Google Drive. Drive.google.com replaces docs.google.com as the place for you to manage your Google Docs. When you sign in to Google Drive, docs.google.com will redirect you to drive.google.com. Note that only items contained in My Drive are synced to your computer and other devices. If you want to sync items from Google Drive online that aren't contained in My Drive by default, just drag them to My Drive. You can choose different views and filters to see recently opened documents, starred items, documents that have been shared with you, items owned by a particular person, files of a particular type, and more. You will have powerful new options to search, sort, or preview your files before opening them. Is Google Drive available on mobile devices? Yes, there are mobile apps for both Android and iOS, available from the Google Play market and the itunes apps store. Is Google Drive available offline? Yes, there are both Mac and PC desktop sync clients available that will automatically sync files in Google Drive into a desktop folder called Google Drive. Does this mean documents on Google Drive are available offline? What does drive sync client do? This is an application in your Mac/PC that puts you in control, decide what you want to sync, Google documents, spreadsheets, and presentations. How does sharing between Google Apps domains and consumer Docs/Drive users work? Just as it does today, Google Docs can easily be shared outside of your domain. Can the Sync Client be preinstalled on computers? What are the supported formats that can be viewed in Google Drive? Google Drive viewer helps you preview over 16 different file types, listed below: Please note that only files under 25MB can be previewed with the Google Drive viewer. Can using the Drive sync client be restricted? Preventing users from installing the sync client is achieved by a checkbox in the CPanel that will block all users in a domain or specific users from syncing data to the sync client. How many computers can be set up to sync files via shared folders? There is no limit to the number of devices that can sync a shared folder. However, this could increase corporate bandwidth usage and costs. For users with multiple devices synced to their Google Drive, settings can be adjusted to sync individual folders to specific devices. Does every edit to a document in a synced folder reflect to all synced computers? Yes, this is exactly what Google Drive enables. How safe and secure is the data stored on Google Drive? I am a ONEOffice user, can I create Team Drive? No, Team Drive is only available under ONEOffice Unlimited offer. What are the differences between Team Drive and My Drive? Can I move files and folders? Users can only move files. Sharing All team members see the same file set. Different users might see different files in a folder, depending on their access to individual files. How long do deleted files stay in Trash? Each Team Drive has its own trash. Files and folders in the Trash are deleted forever after 30 days. Members can delete specific files sooner. Files or folders in the Trash remain there until the user selects Delete Forever. Can I restore files? Yes, if you have Edit access or full access. Yes, if you created it. Is there a file size limit for the files I store in Google Drive? 5GB is the size limit for a single file that can be uploaded to Google Drive. What if a user exceeds their storage limit? They can still access any files already in Google Drive and create new Google Docs file types. However, they won't be able to upload any new documents. What are the storage size for ONEOffice and ONEOffice Unlimited? ONEOffice comes with 30GB shared storage between Email and Drive while ONEOffice Unlimited comes with Unlimited storage for 5 users and above in an organisation. How many files and folders can I create under a Team Drive? You can store up to 400,000 files and folders. But the recommendation is to keep it to a minimum because user might experience difficulties in organising and navigating the content if there are too many files. Is there any upload file size limit under Google Drive? Yes, you can upload up to 750 gigabytes of files per day. The same limits apply to Team Drive as well. What is Domain Name for ONEOffice? This is an add-on service for your business to register your custom Internet Domain Name for use with ONEOffice. Is Domain Name Hosting provided free when we buy this service? Yes, the primary Domain Name Hosting is free when you buy Domain Name for ONEOffice. How would I be able to know if I can use my preferred Domain Name? We provide a simple check for your preferred domain availability at http://singteldns.com/. Successful registration of Domain Name will be subjected to acceptance of our application by SGNIC or other Registry intermediaries. Can I transfer my existing domain name to be registered or hosted in Domain Name for ONEOffice? No, we do not support Domain Name transfers at this time. I am an existing ONEOffice user. Can I buy Domain Name now? No, Domain Name for ONEOffice is only available for new customers. How long is the contract term for Domain Name for ONEOffice? The Domain Name is registered for a period of 12 months. The service fee will be billed annually at the start of each new 12 months period. You can terminate the service at any time with no additional penalty. Will the Domain Name be renewed automatically upon contract expiry? Yes, your Domain Name will be automatically renewed for another 12 months. as long as you do not terminate the service. Why does Singtel implement an automatic renewal for Domain Name? The automatic renewal provides convenience and ensures business continuity to you, as it is common for Domain Name owners forget to renew once every 12 months. My preferred Domain Name is not available. What do I do? Most Internet Registries practice a first-come, first-served policy for Domain Name Registration. If your preferred Domain Name is not available, please select another. Upon purchasing the Domain Name for ONEOffice, why am I not listed as the Domain Name Registrant? Singtel’s partner is acting as a Proxy Registrant on your behalf in order to deliver a smoother, faster Domain Name provisioning process for you. Will I lose my Domain Name to Singtel’s partner since I am not listed as the Registrant? No, you are still the Domain Name owner, even though you are not listed as the Registrant. Should you wish to update the Registrant information online, please click here to contact us. Please note that continued usage and rights to the Domain Name is subjected to your compliance to the policies and regulations imposed by the respective Domain Name Registries. How long does it take for the new Domain Name to be activated? It may take 6 to 24 hours for the Domain Name to be activated. Why are the charges for .sg and non-sg Domain Names so different? The cost of Domain Name Registration is dependent on the fee structure imposed by the respective Domain Name Registries responsible for .sg domains and non .sg domains. For the .sg domain names, do we need any verification with SGNIC? 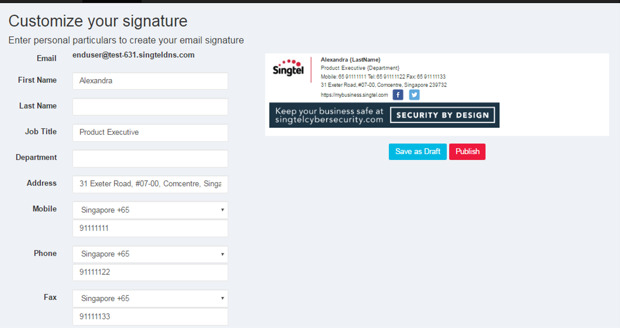 No, you do not need to verify your Domain in SGNIC, as Singtel’s partner will be registering the Domain Name on your behalf. What will I see in Whois/SGNIC once my domain is registered? Can I request to update the Registrant and Administrative Contact to reflect my company details? Yes, you can do so. Please click here to contact us. I created and published my email signature. Will it be synced with Outlook if I configure my ONEOffice email in Outlook client? You can only use your email signatures when you are accessing your email in Google. This is a limitation between G Suite and Outlook. For more information, you can click here and check under 'Mail'. Who can create and update email signature template? Only the ONEOffice Administrator can create and update email signature template on behalf of all the users in the company. As the Administrator, how do I create email signature template for all users? You can click here to learn more about creating the email signature. Please note that your users are required to accept the Google Terms of Service to authorise the usage of email signature. As the Administrator, will I be able to check who has accepted the Google Terms of Service? Yes, you can check from the User tab of Email Signature page. Google is a global technology leader focused on improving the ways people connect with information. Our innovations in web search and advertising have made our web site a top internet property and our brand one of the most recognized in the world. We maintain a large index of web sites and other online content, which we make freely available via our search engine to anyone with an internet connection. Our mission is to organize the world's information and make it universally accessible and useful. We believe that the most effective, and ultimately the most profitable, way to accomplish our mission is to put the needs of our users first. We believe that our user focus is the foundation of our success to date. We also believe that this focus is critical for the creation of long-term value.